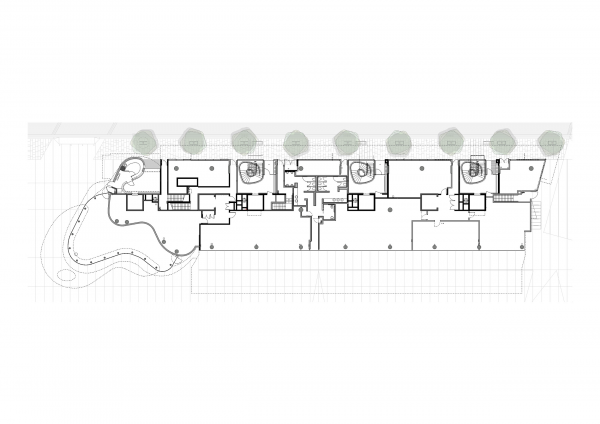 Our approach was to articulate this long linear building into two primary forms; a carefully scaled rectilinear form that defines the waterfront, and a more expressive and organic form to celebrate and define the public open space. 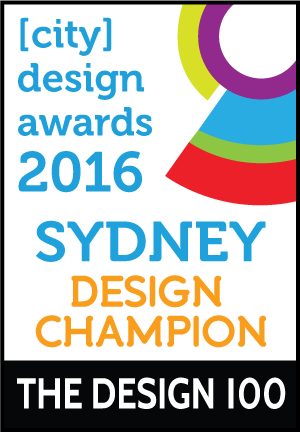 These forms are combined with a linear canopy, gentle terracing and landscape to characterise the public waterfront. The ground level is predominantly retail and lobby access for the above apartments. As part of the Barangaroo South Precinct, the most significant site opportunity is the ability to reconnect the harbour to the western edge of the CBD. 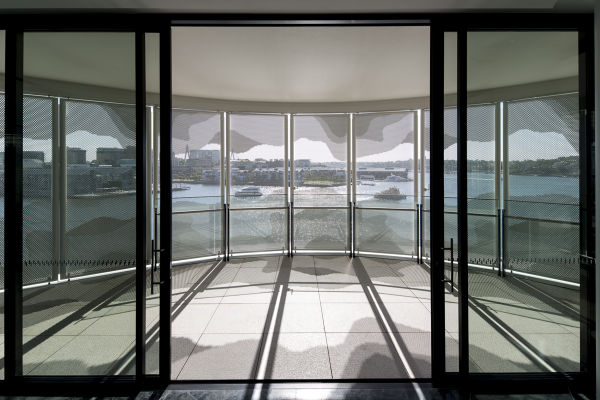 It’s optimum position benefits from uninterrupted views of the harbour. The public domain adjacent to the waterfront also connects back to Darling Harbour reinforcing the public connectivity and walking trail along the harbour foreshore. With its orientation to the public square, Anadara provides a dynamic public realm and encourages activity from Barangaroo through to the CBD and contributes to the liveliness of the precinct and active community along the harbours edge. The Barangaroo South Precinct is an important mixed-use development for the Sydney CBD, creating a vibrant new environment along the harbour foreshore that contributes to the city’s social and economic development and leads the way in sustainability. Anadara formed part of the most successful residential development in Lendlease’s history and set new records for luxury residential in Sydney. It has a unique location with just a five minute walk from the centre of the CBD facing Sydney Harbour and provides a high quality interface with the waterfront while mediating the scale of the tall towers behind them. The design brief included spacious open plans to accommodate a sophisticated contemporary lifestyle leveraging stunning water views. All apartments were to feature generous balconies and a harbour view, with operable shutters for privacy and climate control. Sustainability initiatives were to be incorporated into the design, in accordance with the precinct’s sustainability initiatives. The most signi?cant site opportunity is the ability to reconnect the harbour to the western edge of the CBD and create a public domain adjacent to the waterfront, connecting back to Darling Harbour and reinforcing the public connectivity and walking trail along the harbour foreshore. Anadara is developed with two iconic identities yet cohesively joined through details and design. The building is split into a carefully scaled rectilinear form that defines and characterises the waterfront; and a more organic form that turns to the new public open space to the north. 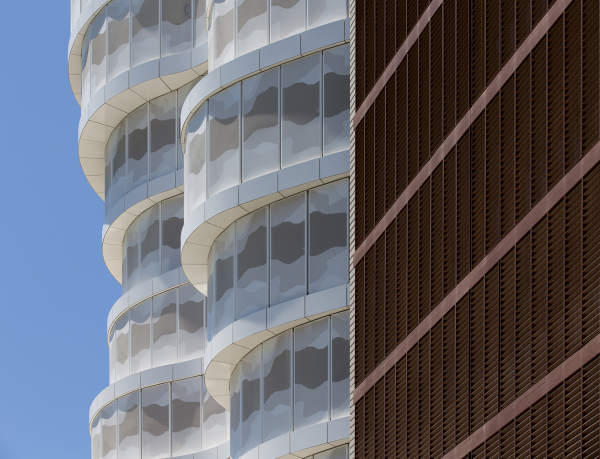 The curved forms are created through facetted panels and laser-cut custom ‘cloud’ patterned sliding balcony screens in light colours which maintain openness within the main vision zones in each apartment. The more rectilinear portion of the building has bi-folding screens to the west and batten screens to the east in earthy tones that reinforce the uniqueness of this portion of the building. Environmental and privacy control is managed through these operable screens and shutters that give a balance of consistency and individual expression to the apartments. 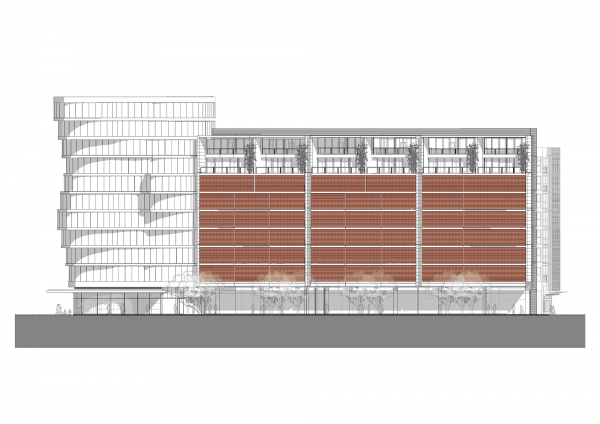 The concept of the ‘cloud’ and the gradually changing curves continues to the ground floor retail and apartment entry lobby. Newly developed materials were used to create the curves within the organic awning design, large panels of curved glass emphasise the form and give a more subtle, less defined edge to the public realm and the changing facade curves and wraps into the interior spaces. 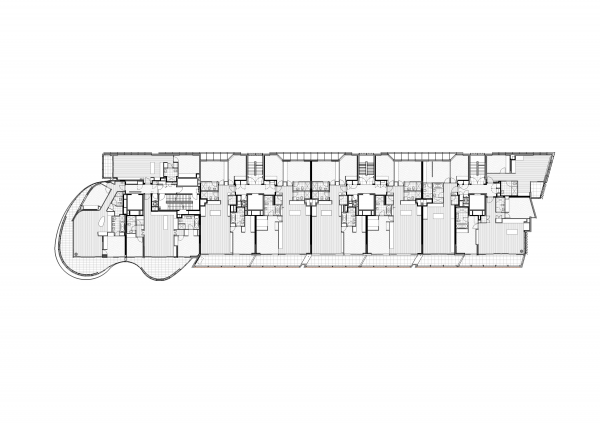 Maximising Views – In order to fulfil the design brief that every apartment had harbour views, the typical floor plates evolved to be designed around four cores in each building. This allowed all apartments to embrace the western harbour view and improved cross ventilation. This evolution included repositioning the egress stair to the eastern façade, which makes it part of the lift lobby and allowed natural light and ventilation. 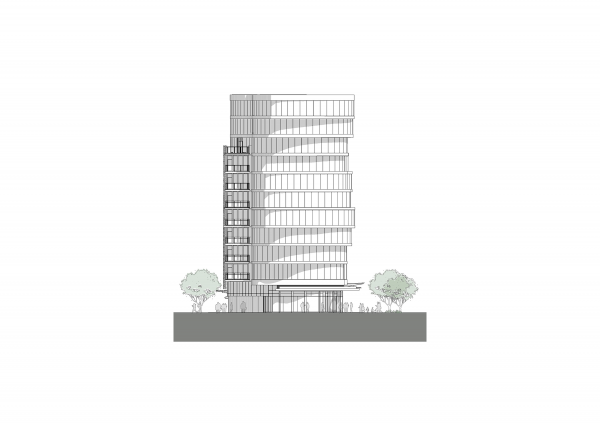 Design of The Cloud – In consultation with the Barangaroo Delivery Authority it was agreed that Anadara, which was originally proposed as a homogenous rectilinear building, needed to better address the site to the north. In response a new organic expressive form of subtle double curves and increased height was added to the northern end of the build that turned towards the public open space to the north. 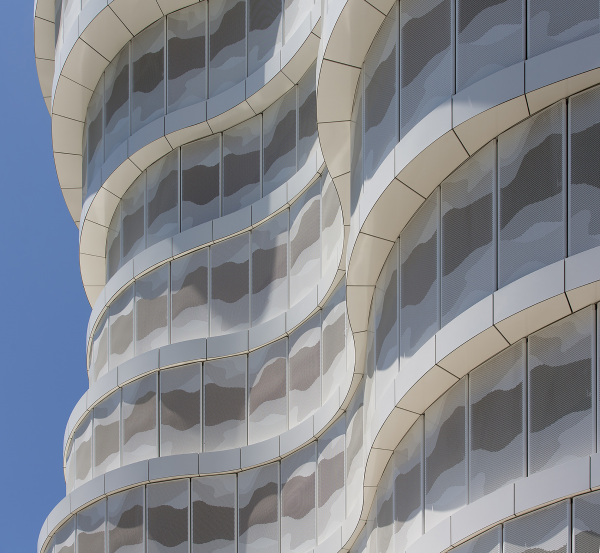 The balconies extend over the boundary to further emphasise the curved nature of the facade and enable variation and movement that gives the appearance of defying gravity. Anadara has achieved a 5 Star Green Star rating. The buildings represent the best in residential sustainability while maintaining luxury design befitting its premium waterfront location. 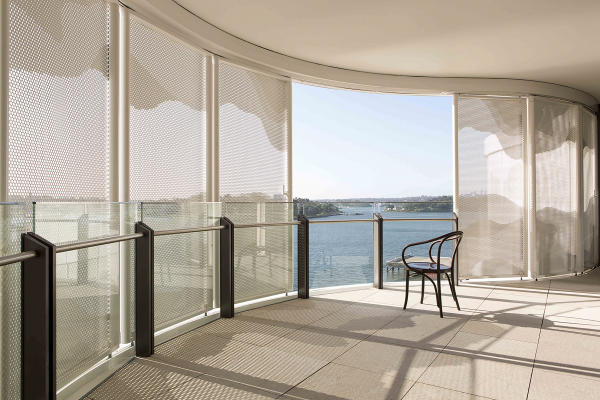 Western Façade Screens – the screens act not only as a mechanism to bring life to the waterfront façade but aid the low double glazing needed to provide thermal comfort to the residents, protecting them from the western sun while maintaining the iconic Sydney Harbour views. 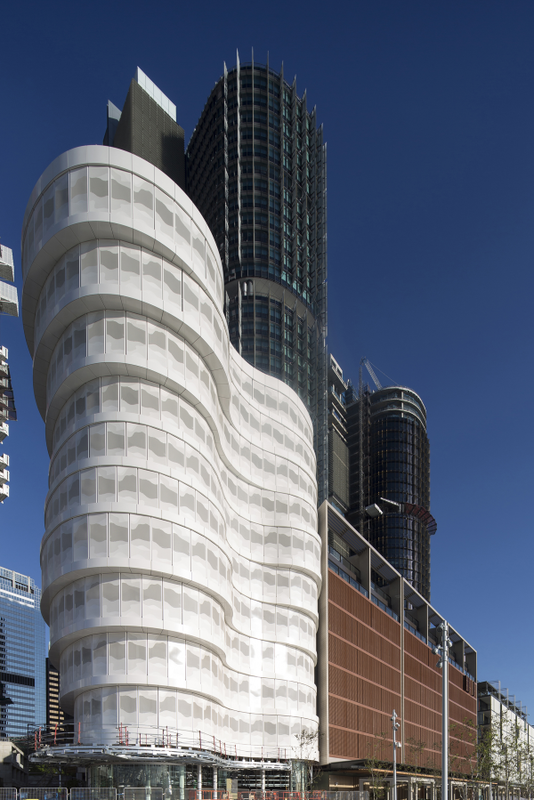 Recycled Water – The buildings are connected to Barangaroo’s recycled water treatment plant which will provide recycled water to the toilets throughout the development as well as the option to connect washing machines. Waste water generated by the buildings will be fed back to the treatment plant for reuse. Solar Power – The roof integrates landscaping and photovoltaic panels that powers the public domain lighting and a recycled water plant. Chilled Water – Air conditioning in the apartments are supplied by chilled water sourced from the Barangaroo district cooling plant, which itself utilises water from Sydney harbour to assist the cooling process. This removes the need for bulky, energy-consuming air conditioning plant on the roof of the buildings.